Today, Bollinger Motors has released its third all-electric truck concept — this time in the form of a double-cab pickup unlike anything on the market. 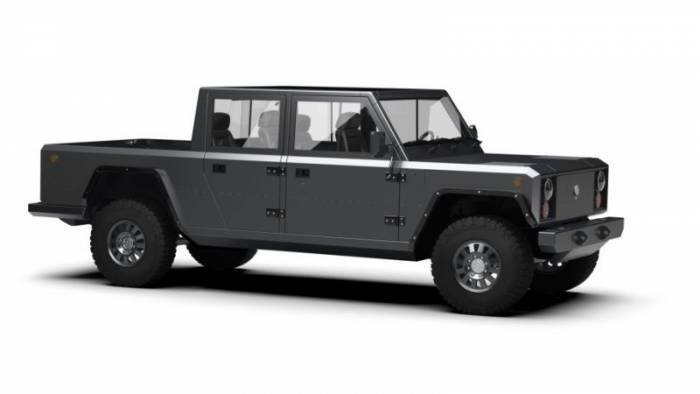 Bollinger Motors hopes to bring the “world’s first all-electric sport utility truck” to life in 2020. While there are no trucks like it yet, a few companies like Tesla are also currently developing all-electric pickups. 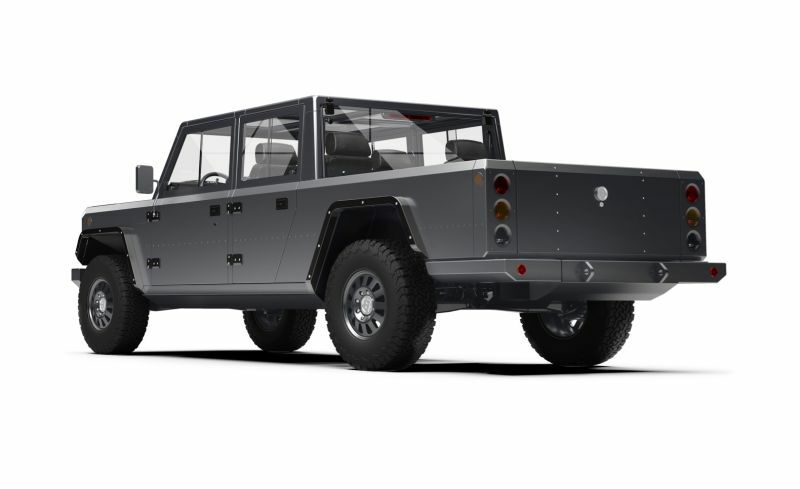 Bollinger Motors showed us the B1, a two-door all-electric sport utility truck, over a year ago. It has since been promoting a four-door version of the vehicle. Now, it models the four-door vehicle into a pickup truck. The new all-electric Bollinger B2 Pickup Truck will have all the impressive features of its siblings. 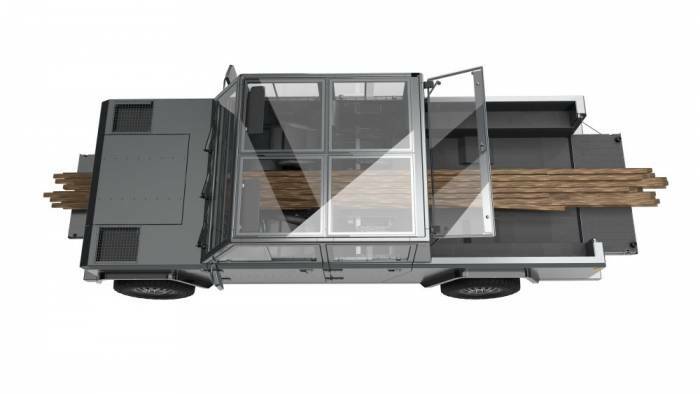 Things like all-wheel drive, hydropneumatic suspension, in-wheel portal gear hubs, a 120-kWh battery pack, large front trunk space, and a patented pass-through door will all come standard. 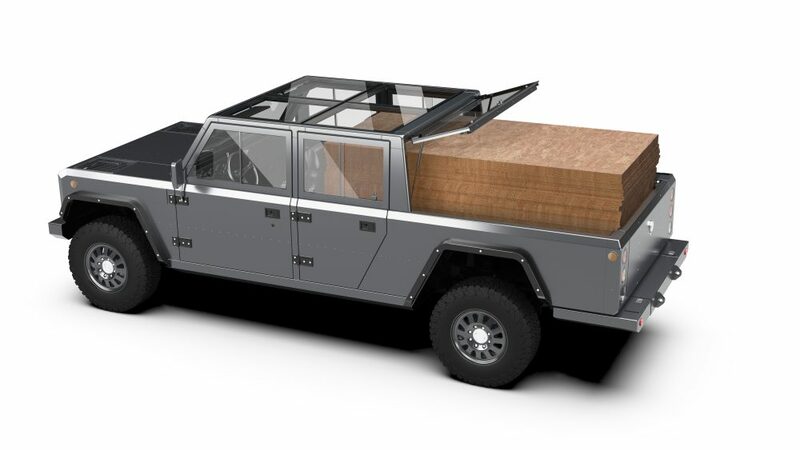 Cargo capacity has been a priority with all Bollinger vehicles, but the new B2 Pickup Truck takes it to another level. The truck bed is 4’1” wide by 5’9” long. There’s an internal cab tailgate that can be lowered, and the rear glass can lift up. Fully opened up, and with the rear seats removed, the new truck can carry full 4’ x 8’ sheets of plywood. In fact, it can accommodate a whopping 72 sheets of half-inch plywood! With the patented front pass-through opened, it can even accommodate 24 two-by-fours. Talk about storage for lumber! Bollinger allows long objects to run the length of the vehicle. Now, will that fit a kayak? 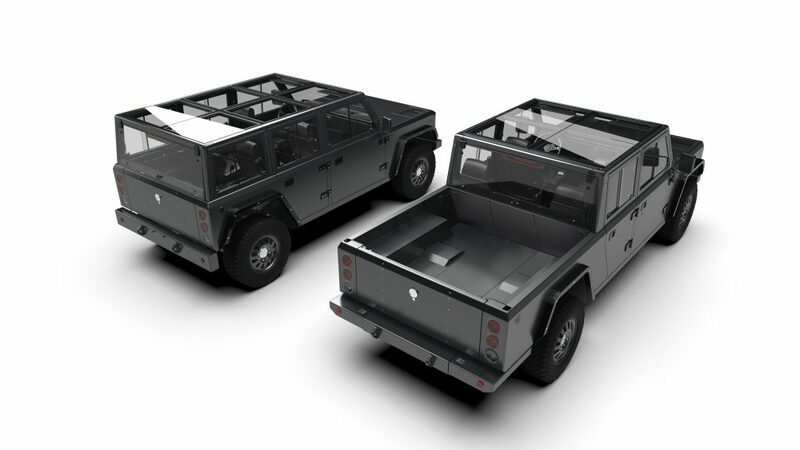 All images here are CAD renderings based of the early two-door B1 prototype and CAD data the Bollinger team has created for the four-door vehicle. Prototype testing of the new B2 Pickup Truck will begin in early 2019, with production expected in 2020. Bollinger has already gathered more than 20,000 reservations for vehicles. While impressive, that’s for a no-money-down, no-obligation spot in line for the opportunity to buy a yet-finalized vehicle without a price tag. With the launch of the pickup, Bollinger is also now allowing people to use different email addresses to get in line for more than one vehicle. Deposits will be taken in 2019 after pricing is announced. We’ve heard this all before, however. In the summer of 2017, Bollinger Motors said production would start in “19-plus months” and that it would start taking deposits in early 2018 for the B1. Production hasn’t started and the brand hasn’t taken any deposits. Bollinger says only four-door B2 models will be available in 2020. The first production units will all be left-hand-drive vehicles for the North American market, with exports to follow at an undisclosed date. All production will happen at the company’s new headquarters in Detroit. There’s so much to like and want about the Bollinger Motors trucks. The rub comes when you realize that it’s already been shown for a few years, the brand has developed three models, no price has been announced, and there’s still nothing in production. Yes, I still want one, but I have a distinct feeling the price tag is going to sting. A lot.